I’m not going to pretend this is Sicilian in the sense that it’s part of the Sicilian tradition. Mascarpone and butter are hardly used at all this far south. Mascarpone for tiramisù, butter for arancini al burro. And that’s about it. No, this is Sicilian in the sense that I learnt it here in Sicily and that it was invented by two Sicilians (I can only lay claim to the name). That’s good enough for me. Nice thing of course about this blog is that I establish the rules. So, Sicilian it is. The ingredients can all be found in a good Italian deli, which is in fact the source of the recipe. My local purveyors of hams, cheeses, olives and English crisps (yes, they clearly know the way to my heart), the wonderful Giovanni and Tiziana of the Salumeria D’Alessandro, just up the road from my house, gave me the recipe one evening as I wandered in just before closing time, tired and uninspired, needing something quick yet soothing, and filling enough to appease my ravenous children. And this is what they gave me. Of course, it’s full of sat fats and probably not going to get a Weight Watchers recommendation any time soon, but, then again, not much Christmas food is likely to, so just go with the flow. Live off oranges for a few days afterwards if it makes you feel better. As you can see from the photo, I used spaghetti, but on reflection, short pasta such as penne or farfalle may have been better. The problem is that the sauce does tend to thicken as it cools, which is no big deal with penne, but does make spaghetti heavy going. Unless of course you eat spaghetti with the speed and dexterity of an Italian. Get a big pot of salted water on to boil, and start cooking your pasta. While your pasta is cooking, melt the butter in a pan over a low heat and then stir in the mascarpone and cream cheese until you have a smooth sauce. Add half of the milk to the sauce, to loosen it up a bit. Season to taste and take off the heat. When your pasta is al dente, drain it and mix with the sauce. Add a little more of the milk if it seems too thick, then stir in the chopped mint, sprinkle over some parmesan if you like and garnish with the mint sprigs. Eat, straight away! As I mentioned above, the sauce thickens and clots very quickly. 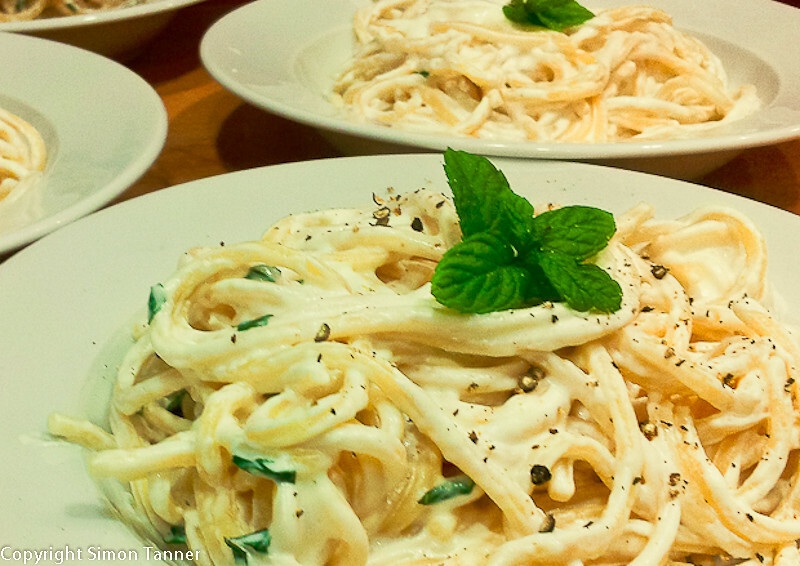 This entry was posted in Cheese, Pasta and tagged mascarpone, pasta by hungryenglishman. Bookmark the permalink.